An adorable cheerleading bride, a handsome down-to-earth groom, and an amazing story of a grandfather who recovered from his stroke to walk his granddaughter down the aisle– you won’t want to miss this one, guys!!! This Wilkes Cheerleader turned pharmacist was absolutely swept off her feet by the love of her life, Joseph, at Capriotti’s in Mcadoo, Pennsylvania ( just outside of Hazleton). Sarah first contacted me in *2012*, yes 3 years ago, about photographing her 2015 wedding. I feel like I’ve known her forever and have come to see what a kind, hardworking, genuine person she is. You may remember Sarah & Joe from their amazing Baltimore engagement (Raven’s Stadium & Baltimore Aquarium). Sarah joked with her bridesmaids that she felt like she was getting ready for a cheerleading competition with all of the morning make-up and hair preparations and the butterflies in her stomach! Her bridesmaids were wonderful and really focused on all of Sarah’s preparations. Photographically speaking, I am a fan of high contrast black and white images– see how Sarah’s dress really “pops” in this image? Sarah’s grandparents played a huge role in her life. She spent a lot of time with them growing up and was their only grandchild. They have always been so supportive of Sarah’s decisions and very proud of her. Sarah you are absolutely stunning!!! Now onto Joe– he is an intelligent, down-to-earth guy who has a great sense of humor and is super loyal. All of Joe’s groomsmen grew up together as kids. For Sarah, having her grandfather at her side was priceless. He was the main father figure in her life growing up. A year ago, her grandfather suffered a series of strokes and lost his ability to walk. Walking Sarah down the aisle was important to him and gave him a goal and motivation to push through his recovery. Through much rehab and hard work, just weeks before the wedding he was able to walk on his own. Love the expression on Joe’s face here, too– it’s the big moment– here come the rings 🙂 The priest had instructed Joe during the rehearsal to “practice his outside voice” so everyone could hear him. Sarah is laughing in this photo because she was imagining the sound of Joe’s “outside voice” (which is more of a yell), Joe is, too. He really made an effort to keep Sarah laughing and relaxed. They are adorable. That a team! Joe was such a gentleman, carrying her dress, etc. Whenever I’d make a comment about how sweet he was being, he’d just say “A happy wife is a happy life” hahaha. When I mentioned a pretty “off road” spot, Joe instantly swept Sarah off her feet (literally) and carried her there. After photographing the bridal party and couple’s portraits at Penn State Hazleton, we were on our way to the reception venue, Capriotti’s. Capriotti’s was particularly important, as it was where Sarah was hired for her first job, at age 16. She and one of her bridesmaids worked there together for over 7 years! It is actually even how Sarah first met Joe!!! Sarah & her friend have seen hundreds of weddings together and were enjoying being on the receiving end of the festivities. The reception hall was lit in Baltimore Raven’s purple, and their lovely cake was on display. 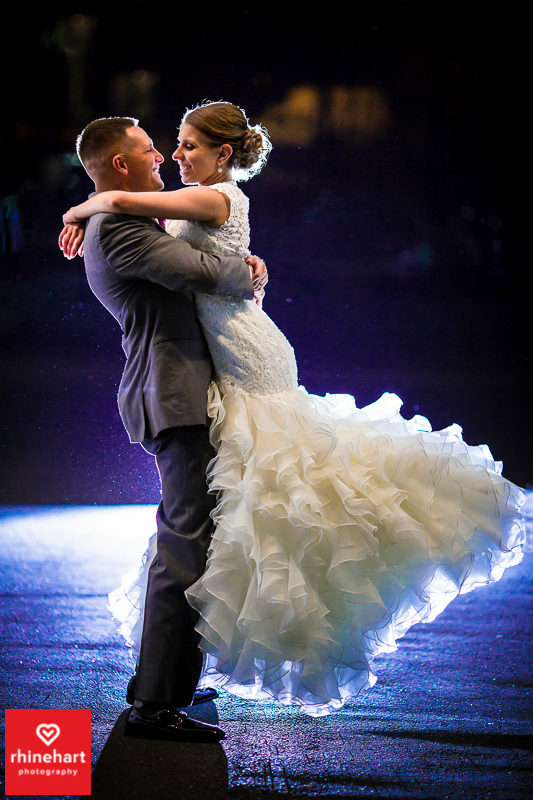 While working at Capriotti’s, Sarah had the opportunity to see the work of hundreds of wedding vendors, and she planned her wedding so far in advance that she was really able to have her pick of all of her favorites. There are two things that really got the wedding guests laughing, one was Joe’s entrance for the garter, he arrived in his full Penn DOT attire (complete with headlamp) ready to find that garter. The other was the Polish Wedding Circle, which Sarah’s family calls “rescue the bride”. Joe’s friends surrounded Sarah, their arms locked tightly in a circle and tried to keep Joe out. I already shared the moonlit image of the couple, this is the other “happily ever after” image that I photographed of Sarah & Joe. I made sure to capture Capriotti’s, as it was the start of their relationship, Sarah’s workplace before and during pharmacy school and their wedding reception venue. Sarah shared that taking this time out together made her think about just how well everything had gone, that they couldn’t have asked for a better day or a better group of family/friends to share it with.